As mentioned in a recent post MacVector has a powerful feature called Subsequence searches. This function allows you to keep a library of sequence pattern matches, using a powerful nomenclature with up to three parts, and quickly scan protein and nucleic acid sequences with this library. .Although MacVector ships with a number of collections of interesting sites of both proteins and genes you can easily create your own subsequence files. Many labs have collections of commonly used primers, and one popular use of subsequence searching is to store these primers in a subsequence library. This makes it a simple procedure to scan a sequence with the entire lab’s primer library. Open this file with PrimerConverter and then save it as a MacVector Subsequence file. The application is included with MacVector, however, you can download an updated version of this utility from here. 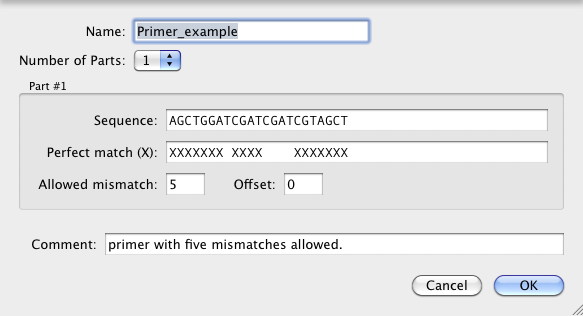 As well as indicating the number of mismatches allowed Subsequence searching also allows you to choose which residue of a match needs to match perfectly. For the CSV file you can set residues to be lower case to indicate they don’t have to be perfect matches. Primer_example, AGCTGGAtCGAtcgaTCGTAGCT, primer with five mismatches allowed. Make sure that the Allowed Mismatch field is set appropriately (the default will be to allow only the characters that do not need to match perfectly). You must be using the above release of PrimerConvertor to do this. This entry was posted in Techniques, Tutorials and tagged pcr, subsequences. Bookmark the permalink. Both comments and trackbacks are currently closed.